As with any holiday, it’s important to begin marketing about 4th of July immediately after the previous holiday. In this case, it’s Father’s Day. Otherwise, how else will everyone know how culturally relevant you are? Since you’re a clever brand that knows what people associate with Independence Day, it’s absolutely crucial that you use any (or all!) of the following words and phrases in your subject lines. If you don’t have a gif of fireworks in your email, what are you thinking?!? Everyone loves gifs (pronounced the CORRECT way, with a hard G). Gifs can go in emails. HOW COOL. HOW ORIGINAL. HOW PATRIOTIC. Americans also love a good artfully curated picnic table covered in red, white and blue items. We like to have cookouts on summer holidays (HECK YEAH WE DO! ), and everything on our tables must be color-coordinated to match the holiday we’re celebrating. Some of us even go so far as to dump out our purses filled with expensive patriotic items all over the table so that everyone else at the cookout can see how much more patriotic we are than everyone else. 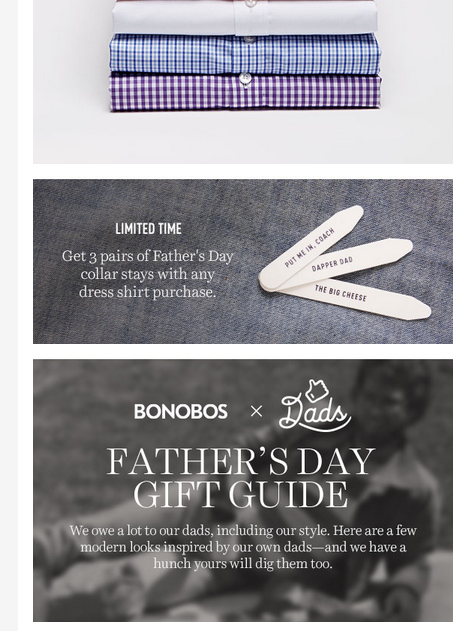 Step 4: Unless you’re Bonobos, just go home and try again next year. ‘Murica. 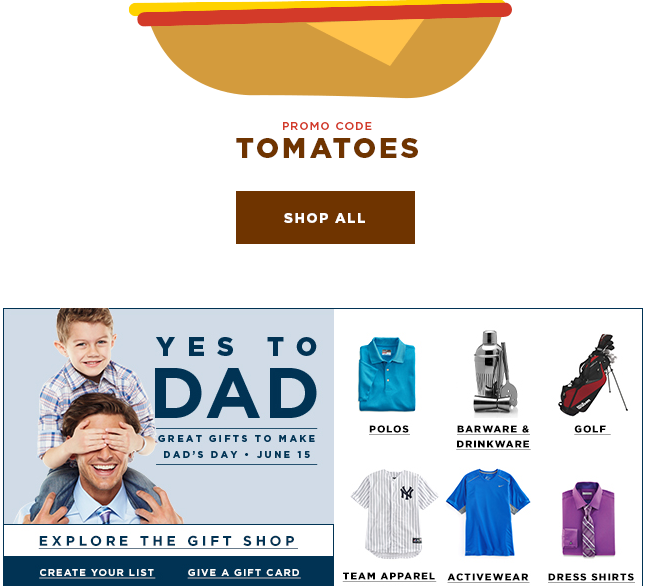 I have 105 emails in my “Father’s Day” label right now. I haven’t even opened about half of them – I just lazily did searches for Father’s day and applied the label. 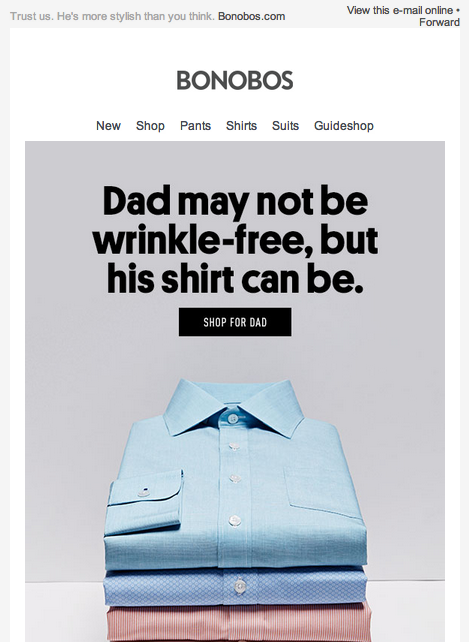 It’s no surprise that certain brands really pushed it hard with the Father’s day emails – Lowe’s, Jack Spade, Bonobos, and Nordstrom Rack – Men’s are sending a lot of emails. 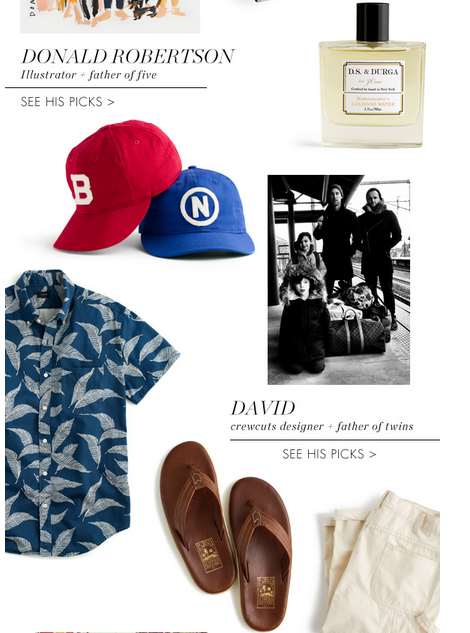 (None of these are stores at which I would buy something for my dad, but whatever. Okay, maybe Lowe’s. If I lived near one. Or if I lived near my dad.) 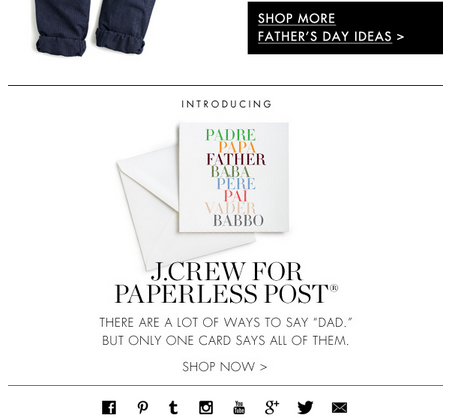 I wanted to write about cringe-worthy/bad father’s day emails, but I honestly didn’t get that many. So most of these emails are really good. 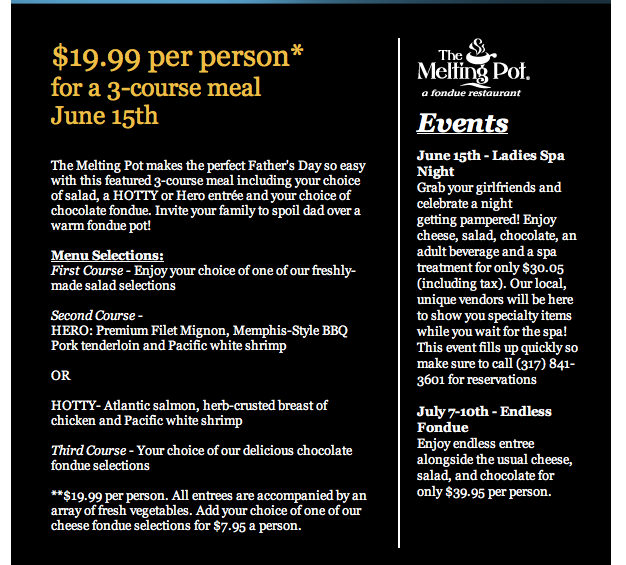 Except this first one… It’s for a fondue restaurant chain, The Melting Pot. 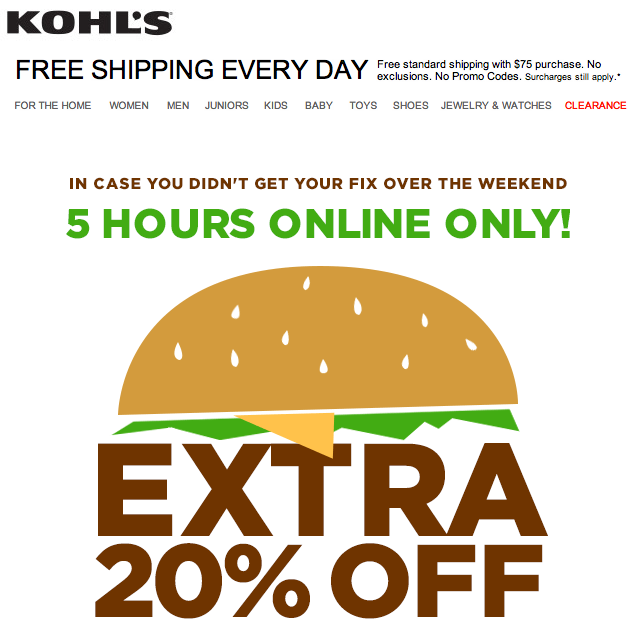 The email has information about a specific location at the bottom, so I’m not sure if this promotion was national or what. Just…. just look at this. I can’t. This next email was a bit of a surprise. 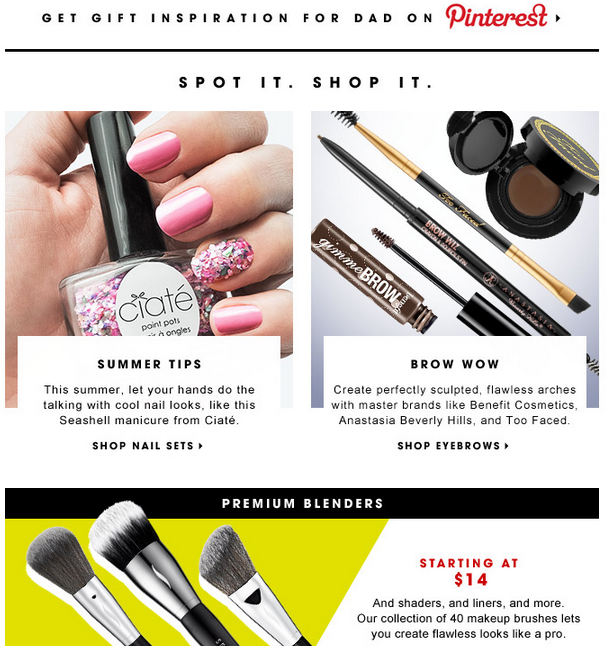 I enjoy Sephora’s emails a lot, and I think they do a great job with their loyalty program. 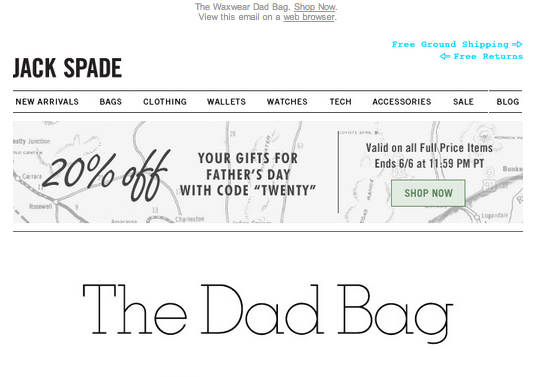 But it’s not exactly the first place I would think of to purchase a father’s day gift. (Or, perhaps it’s genius. 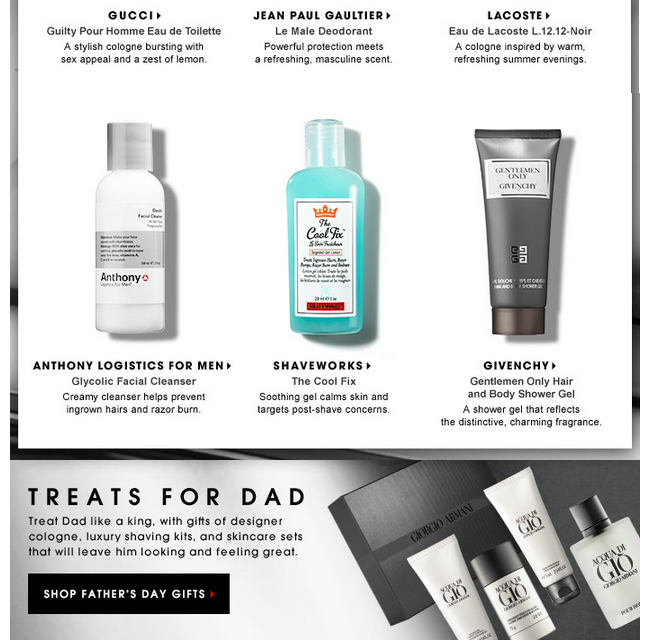 I buy my dad a grooming kit or cologne or whatever, and then get the free gift of the month/points for the loyalty program. Everyone wins.) 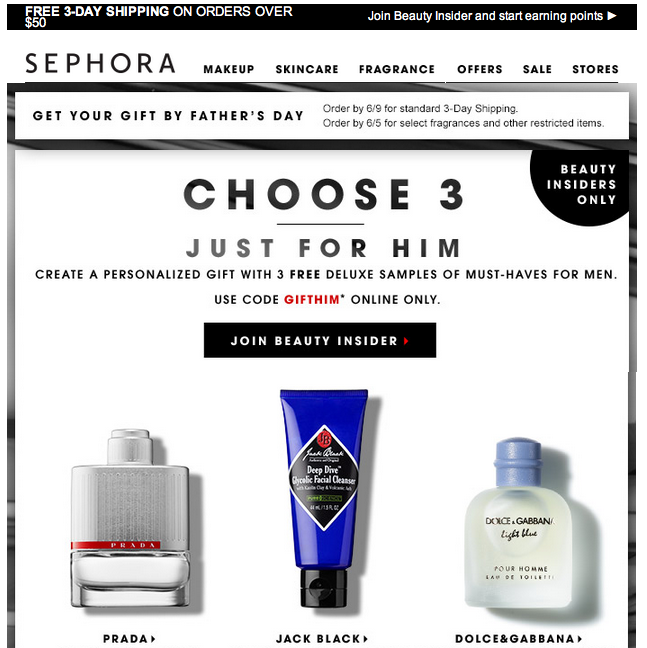 The email was nicely designed, as usual for Sephora. 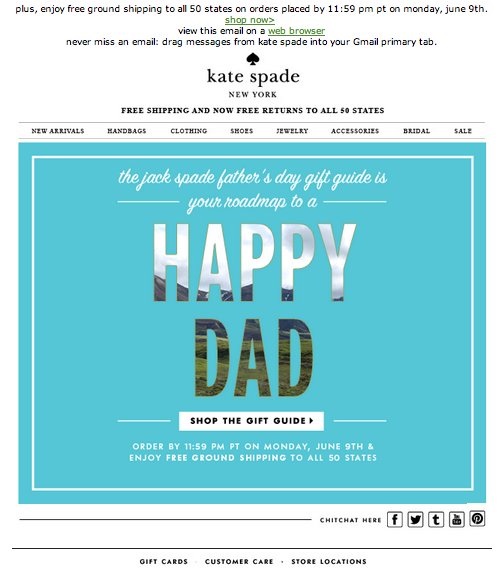 The Spade brands are really on top of their game with emails. Anyone who’s read at least 3 consecutive posts on this blog (any three, doesn’t even matter) could easily see that I’m totally obsessed with Saturday. I thought these brands did a nice job of leveraging each other’s audiences and strengths. 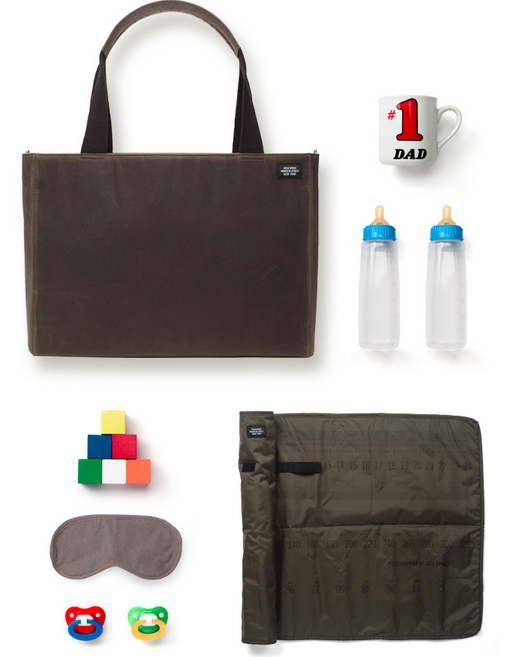 Jack Spade obviously has plenty of products geared toward men, and they’re certainly nice enough to be father’s day gifts (and they even steer away from ties and golf stuff!). I particularly liked this one – it took the angle of wives (or husbands…) shopping for their husband who happens to be a father. I guess that’s totally normal. I’m still coming to terms with the idea that my peers are becoming parents, and this type of email would be just right for my demographic. This email was just good. 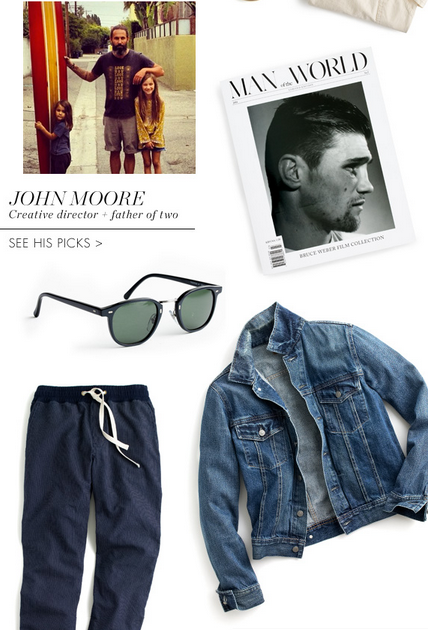 The pre-header and content were funny, it had a neat gift with purchase, and they promoted blog content with dad-inspired outfits. 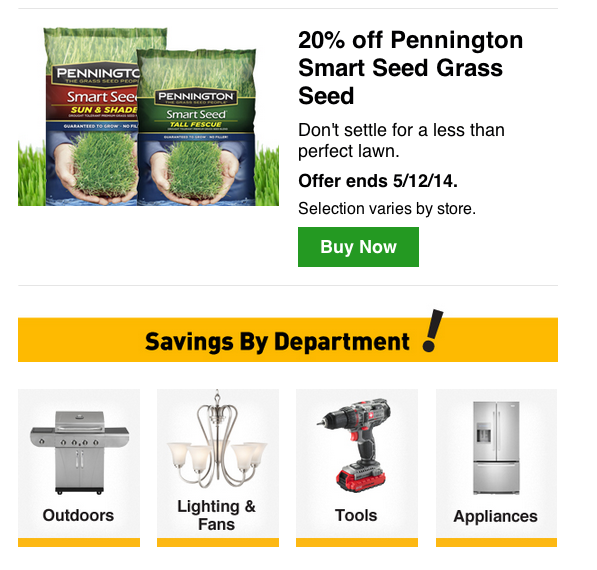 When I got my first “Spring Black Friday” email from Lowe’s on May 1, I tensed up a little. Is this really a thing? Am I going to start getting Spring Black Friday emails on top of the 40 Mother’s Day emails I’m already getting every day too? 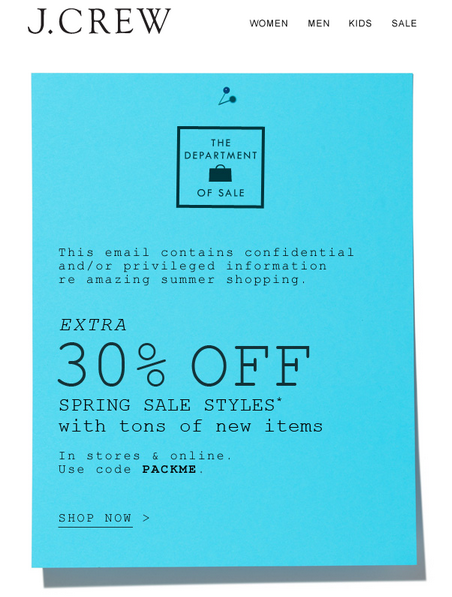 Over the next few days, I kept my eyes out for Spring Black Friday emails from other brands. Like it or not, Black Friday is powerful and works because just about every brand participates. They pretty much have to. Even brands that don’t do promotions (like mine) still have to send some sort of counter Black Friday email to stay relevant. But Spring Black Friday? I’m sorry Lowe’s, but this is the Fetch to your Gretchen Weiners. As in, stop trying to make it happen. It’s not going to happen. Don’t worry, marketers. 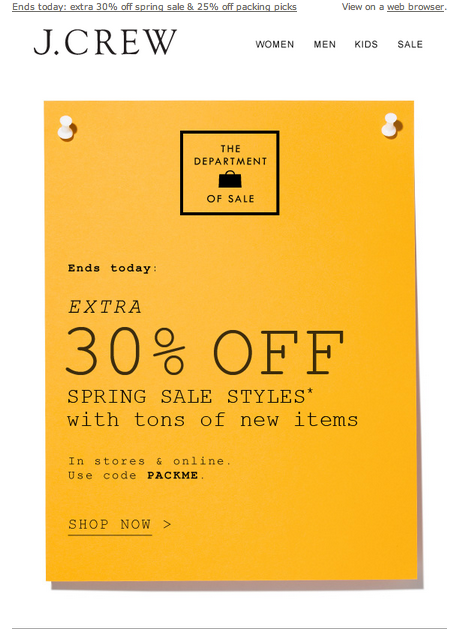 Spring Black Friday isn’t a thing. 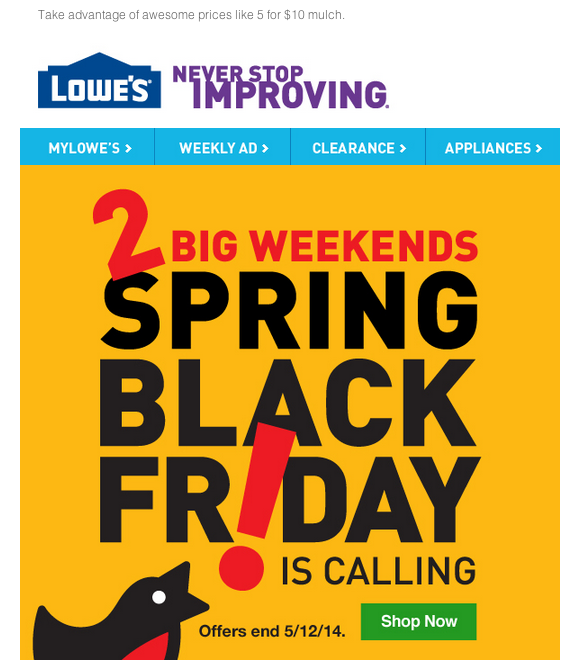 Lowe’s is the only brand I saw sending emails about it. And it wasn’t even a Friday. It was two whole weekends. The whole campaign was executed so poorly they’ve pretty much guaranteed this will NEVER be a thing. May 8: Final Days! 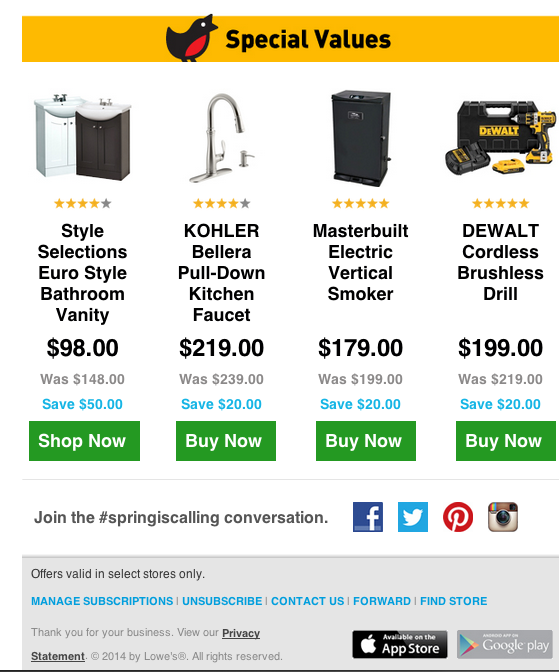 Spring Black Friday Savings! May 10: Spring Black Friday is Almost Over! May 11: Don’t Wait! Spring Black Friday Ends Tomorrow. S0, of these days, May 2 and May 9 were the only Fridays. Yet this one “Friday” seems to extend Thursday-Sunday, for two weekends in a row. Why call them Black Friday at all? For me (and this may be the extreme introvert talking), “Black Friday” conjures up thoughts of getting up way too early, cold weather, stampedes, extreme crowds, and a lot of anxiety. However, Spring, gardening, and working on making my apartment nicer… don’t. 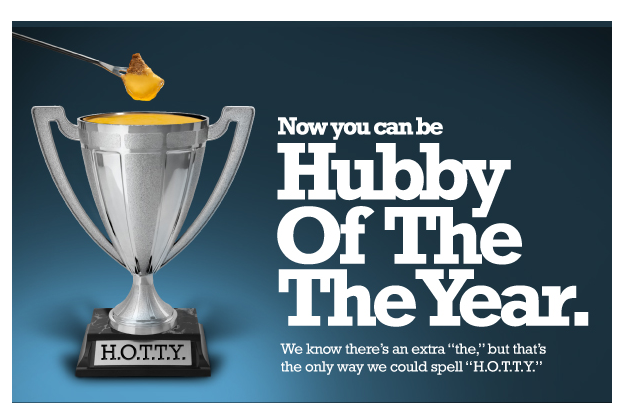 I don’t want to make a sexist generalization here, but I’d imagine their target demographic is men. Men probably don’t react to Black Friday the same way women do (other than camping out at Best Buy, I guess), and I bet they care about Black Friday even less. Then there’s the personalization by city thing. Lowe’s has a few locations in Brooklyn and eastern NJ, but they’re way too far away for most people in New York City to want to shop at. Most purchases at this type of store are generally bigger and require a car (or, you know, owning a home or yard that needs improvement). We have several Home Depot locations in Manhattan (near subway stations, no less! ), and a few in Queens. Since this campaign was a pretty big deal for Lowe’s (I guess? ), and they sent eight emails about it, surely the emails were at least really good, right? Meh. Granted, I’m not exactly their target market (despite my NYC location. Or something). I have no idea if these are even good deals, since I never really purchase any of these items, and won’t need to for the forseeable future. 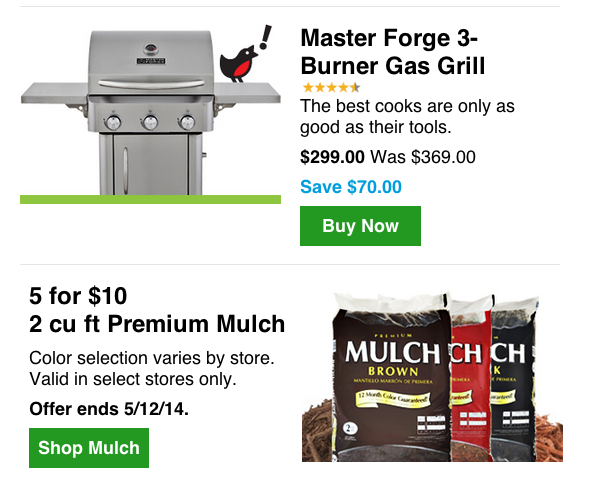 Lowe’s emails always have a very – basic design that just screams “I was built in in a WYSIWYG.” I don’t even mind that it’s simple. Really simple. 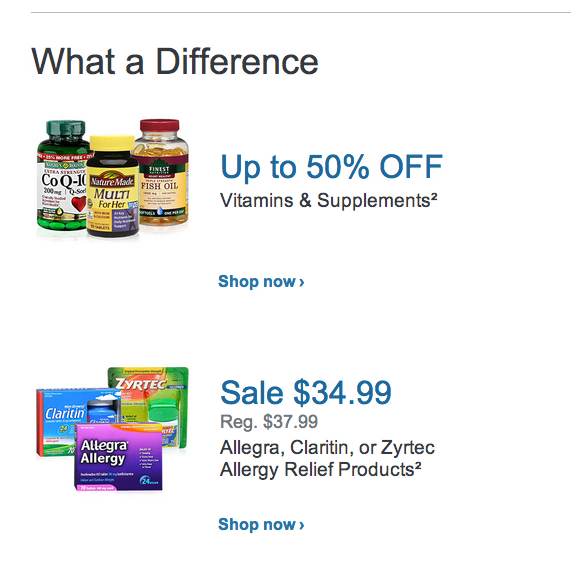 I’m a little curious about the language of the green buttons – some say “Shop now” and some day “Buy now.” Was that an A/B test within the email (which wouldn’t work, since it’s totally different products and price points), or just inconsistent copy editing? I’m just glad we all survived another Black Friday. 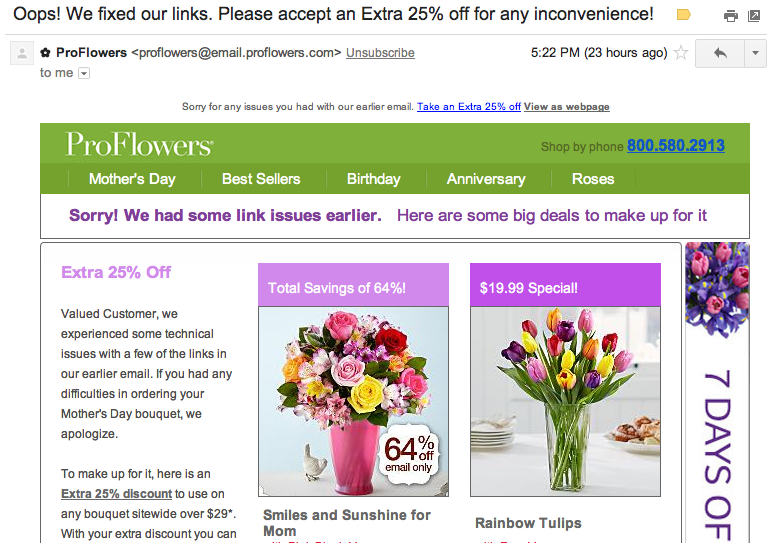 I’ve received about 70 emails specifically about Mother’s day (in this account) since April 7 (maybe more, I dunno. They all blur together.). Some of the emails have been helpful, some have been overkill, and some have been flat-out weird. Here are the weirdest. 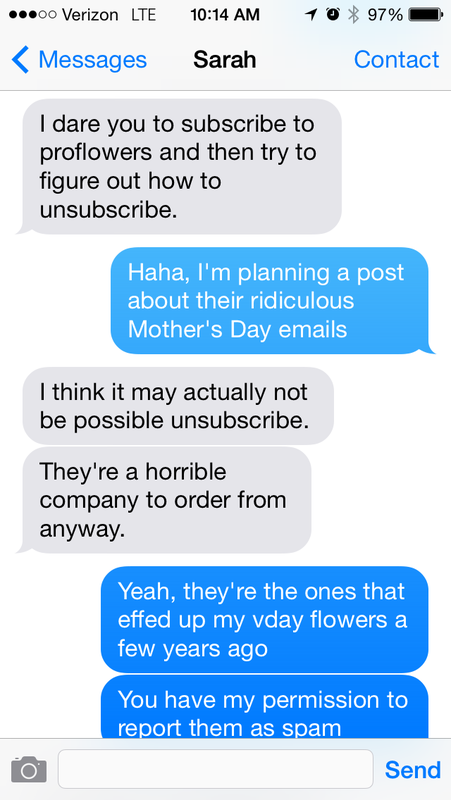 I realize that Mother’s day is a pretty big deal for flower companies. Flowers are probably the easiest/most obvious Mother’s day gift there is. And flowers can get pricey, so it totally makes sense that frequent discounts are a great way to market them. That doesn’t make it okay for them to violate CAN-SPAM. 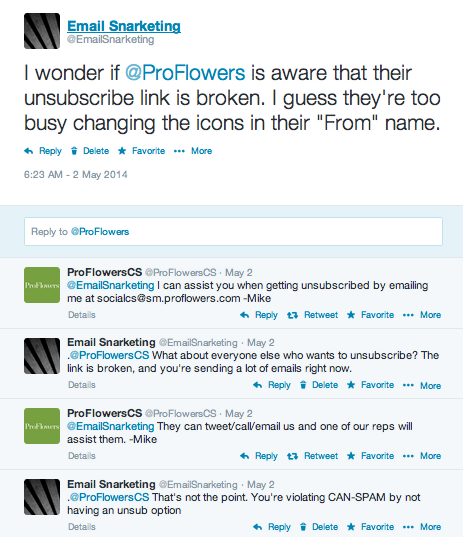 But even before the broken unsubscribe link incident, some of their Mother’s day messaging was already on my list for this post. First, they’ve been playing around with different from names/icons in from names. Okay, fine. But as someone who hasn’t purchased from you yet, this can be confusing. Why are you calling me a VIP? 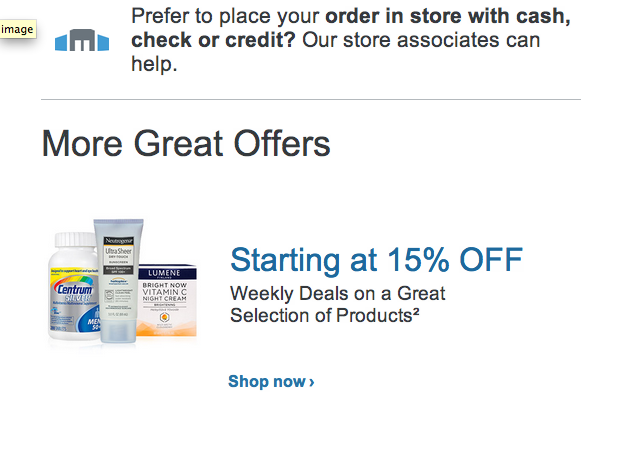 What, exactly, makes ME a “great customer”? If I’m a great customer (me, someone who doesn’t order flowers from you and instead writes cranky blog posts), I’m a little concerned about the stability of your business. 4/29: ✿ Stunning bouquets for Mom, from $19.99! 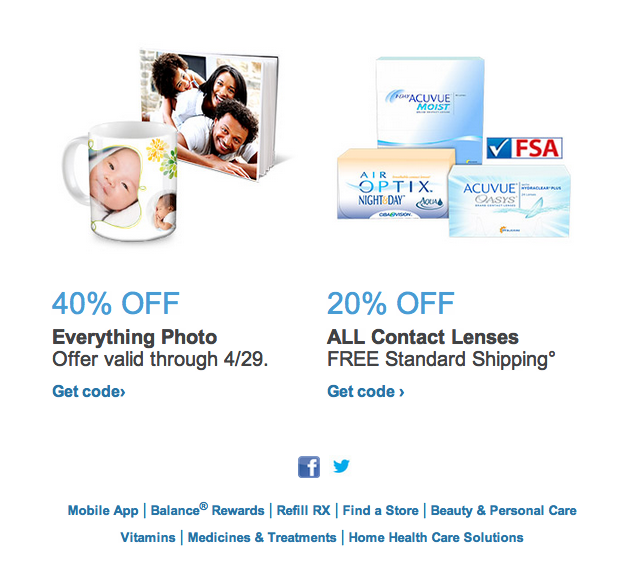 4/30: You only have ➊ week left to Avoid Rush Delivery Rates. Don’t wait! 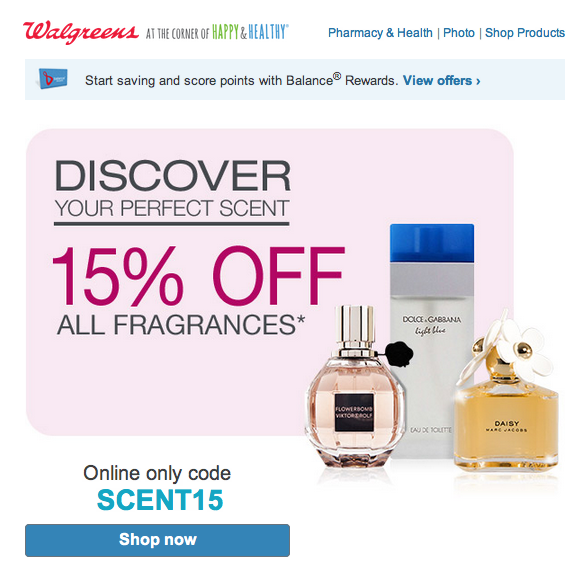 5/1: URGENT: Last Chance for a $19.99 Special for Mother’s Day! 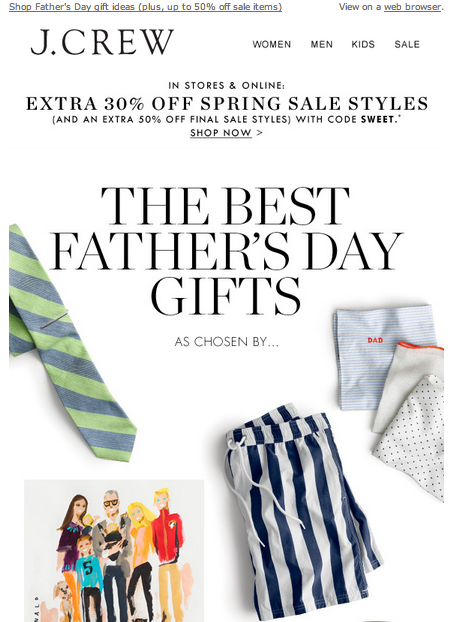 5/2: Get 61% off this Mother’s Day Email Exclusive. 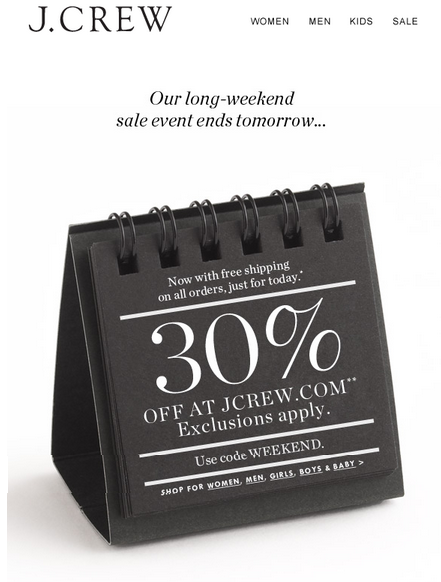 Through This Weekend Only! 5/2: Oops! We fixed our links. Please accept an Extra 25% off for any inconvenience! It’s hard to take any of these extremely urgent subject lines seriously, especially since they’ve already shown a pattern of offering increasingly better discounts. The $20 credit seems like the best deal so far. They have a minimum purchase price of $29.99 (so that $19.99 special from 4/29? It’s an upselling trick to get you to add on chocolates and a colorful vase), but if the $20 credit counts toward that, it might actually be worth ordering some flowers. Maybe I will. (Does that mean their emails worked, or does it mean I’m just curious to see what kind of messaging they’ll send next year since they’d have some info about me and who I might send flowers? I’ll just say it’s the latter.). I hope you’re not buying anything more than a card as a Mother’s day gift from Walgreen’s, but if you are, they have some interesting suggestions. The subject line is probably something most people can relate to – Hey, I ❤ Mom too! Maybe this email will have something relevant to that. Let me just stress that while I did my weird campy spliced screenshot method, this is the full email. 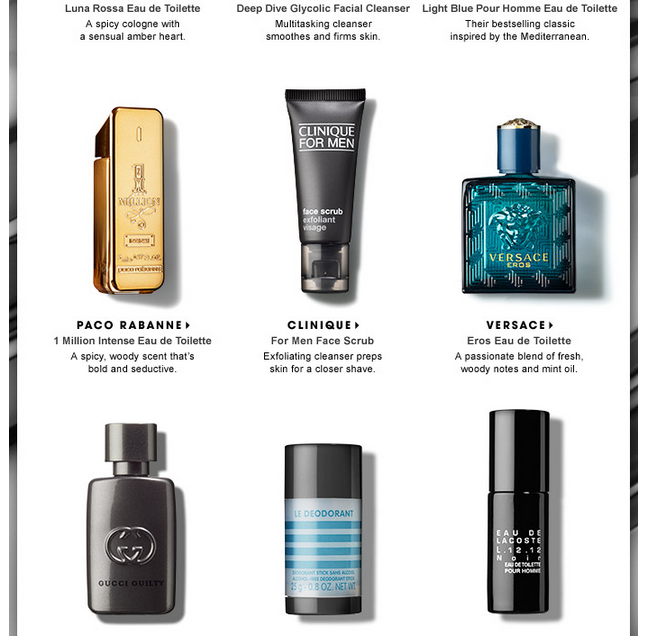 I didn’t accidentally forget to take a screenshot of the copy explaining that fragrances might be a good gift idea for Mom. I didn’t cut out any kind of sub-head that might have said, “Okay, now we’re moving on to feature other products we also sell. 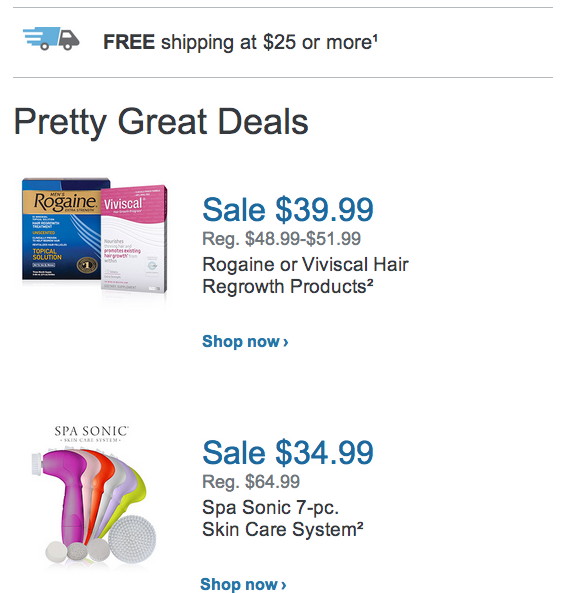 Don’t buy Rogaine for your mom for Mother’s day.” Nope, the full email is right here for your viewing pleasure. But seriously – don’t buy your mom Rogaine for Mother’s day.